Throughout this roadmap process, national governments and their key partners will define the most critical actors in community-level primary health care systems and their roles in achieving outcomes. Extending preventive, promotive, and curative health services into communities is a critical aspect of ensuring access to high-quality primary care. Community health efforts can also provide a cost-effective platform to countries pursuing universal health coverage, especially given the potential to address multiple health needs with integrated community-level approaches. Despite growing momentum and country-level progress, community health programs are massively underfunded. For example, scaling community health worker programs in Sub-Saharan Africa would require an additional $2B annually. Where funding does exist, it is often fragmented and uncoordinated, with little alignment to national strategies. This can lead to fractured approaches, insufficient community ownership, and poor integration with the rest of the primary health care system. This is an especially important moment to act on community health, building on the country commitment and global partner alignment around primary health care surrounding the 40th anniversary of the Alma-Ata Declaration. Source: Financing Alliance for Health and USAID ”Closing the $2 Billion Gap”, 2017. Strong, sustainable health systems promote, protect, and expand access to health at scale. In order to achieve this vision, partners are working with Ministries of Health across multiple countries to develop this investment Roadmap. The Roadmap will elevate national priorities and create a common agenda for investments in community health to strengthen primary health care. The Roadmap will be launched in 2019. We invite you to join the process. The Roadmap will highlight the greatest opportunities for impact in community health the coming years, as identified by the Ministry of Health and key partners. Fifteen countries have been selected for initial inclusion in the Roadmap, based on assessment of potential health impact and feasibility. Additional countries are encouraged to join the Roadmap process. Country consultations to identify priority investment areas for the Roadmap are underway. Click on a country in the list to learn more about national community health priorities identified so far. These priorities will continue to be updated based on country feedback. Investments in these priorities can leverage ongoing partner efforts in the community health space and other areas. Click here for more detail on cross-country priorities. The Roadmap will continue to be developed in the coming months and will be launched in 2019. We invite you to join us in this ongoing process, and commit to supporting community health more effectively. There will be opportunities for stakeholders to review and provide input to the roadmap in the coming months. Contact us with input, questions, comments, or to get involved. Spotlight: What does this look like in practice? In 2012, the government of Ethiopia and development partners worked together to align resources behind the country’s national community health strategy and Health Extension Program (HEP). 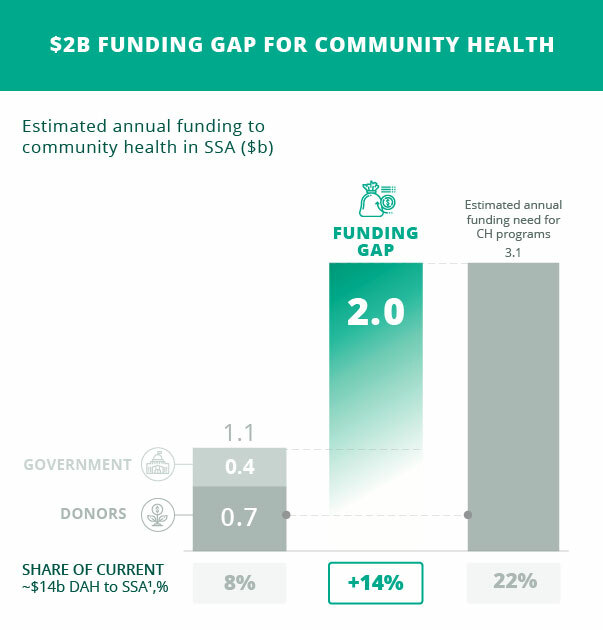 Today, all community health funding flows through government ministries to HEP, or through partner programs that align with national priorities. The HEP is widely credited with greatly improving Ethiopia’s health outcomes - the country has seen a 2x increase in immunization rates, 2.5x increase in contraceptive prevalence, and 10x increase in skilled attendants at birth since its inception. USAID, UNICEF, and the Bill and Melinda Gates Foundation developed a Memorandum of Understanding to collaborate on a set of jointly defined investment priorities that advance frontline delivery of primary health care and community engagement in health systems. The Integrating Community Health collaboration focuses on partnerships; measurement, learning, evaluation, and accountability; and, advocacy and pathways to scale. The collaboration provides catalytic support to 7 countries, the Institutionalizing Community Health Conference (2017 and 2019), a community of practice for south to south learning and agenda setting; and the development of national and global public goods focusing on metrics, evidence and advocacy. The partnership, which is an important step toward stronger coordination between donors and partners across countries, represents action to collaboratively support community health. * Source: Financing Alliance for Health country case study, 2017. At its launch, the Roadmap will highlight and track commitments like these to integrated, coordinated, country-led community health investment. With thanks to the many funders, partners, and other experts who have provided input so far. We want to hear from you! Contact us at admin@communityhealthroadmap.org with input, questions, comments, or to get involved.